Westinghouse is currently holding commercial negotiations with Nuclear Power Corporation of India Limited for the construction of six reactors. NEW YORK/NEW DELHI: US nuclear giant Westinghouse Electric Company today filed for bankruptcy protection, raising uncertainties over the implementation of the landmark Indo-US civil nuclear deal. While India, which is monitoring developments, emphasised that the outlook of global industry on cooperation in India's civil nuclear programme remains "positive", the US reaffirmed its commitment to Indo-US civil nuclear cooperation. Westinghouse Electric Company is a US unit of Japan's Toshiba Corporation. Toshiba said in a statement that the unit filed the Chapter 11 petition in the US Bankruptcy Court of New York. Westinghouse is currently holding commercial negotiations with Nuclear Power Corporation of India Limited (NPCIL) for the construction of the reactors. India and the US were hoping to operationalise the pact by June 2017. Reacting to the development, an External Affairs Ministry official in New Delhi said, "There are commercial negotiations. We are monitoring all developments. We are engaged with all parties. "Our intent is to stick to the deadline for which competitive financing arrangements need to be in place. It must be emphasised that the outlook of global industry on cooperation in India's civil nuclear programme remains positive." When contacted, the US Embassy spokesperson in New Delhi said, "We have been closely following developments at Westinghouse and Toshiba. We defer any questions regarding the financial situation of Toshiba or Westinghouse to those respective companies." However, the spokesperson said, "We understand that Westinghouse continues to stand behind the delivery model that it presented in its Technical Commercial Offer to India, which included an Indian construction partner, and looks forward to progress on an agreement in 2017. "We reaffirm the US government's commitment to civil nuclear cooperation with India." The embassy spokesperson also noted that the AP1000 technology is a top quality option in nuclear power generation and the benefits for India, ranging from access to this technology to providing clean power to 60 million Indians, have not changed. 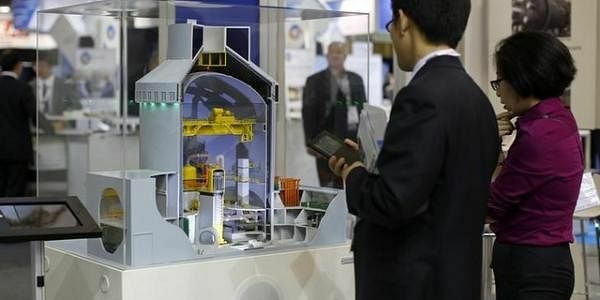 Toshiba said the nuclear unit had racked up debt of USD 9.8 billion.